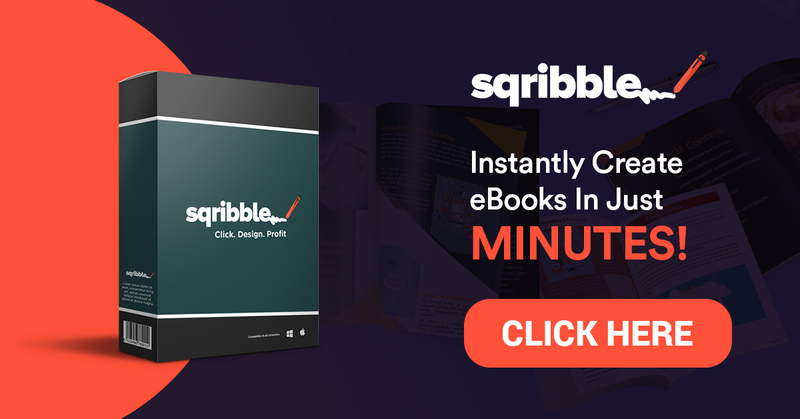 In this review, I’m going to be taking a closer look at Sqribble — a brand new cloud-based tool that allows you to create eBooks, reports, white papers or other digital books on the fly, quickly and easily. We’ll cover what it does, who it’s for, how much it costs, what the upsells are, and the pros and cons of this new tool, so you can make a more informed decision about purchasing it… and if it’s right for you. Sqribble is a cloud-based eBook creator tool. It allows you to create professional looking eBooks, based on templates inside the tool, with a few clicks, saving you a huge amount of time and money. Create Flipbooks — this is one of my favourite things about Sqribble. You can turn your “flat” books into interactive flipbooks. This makes your digital book look and feels much more like a real book — with pages that turn (animated like a real book page turning) and make the book look like something you can reach out and grab. It’s about standing out and grabbing attention. Plus, it’s a way to engage your readers better. If they enjoy the experience of reading your book (“flipping” the pages) they’re more likely to get value from your content and keep reading until the end where your pitch or call to action is! Another thing about flip books is that you can embed them on your website with a simple piece of code that Sqribble provides once you publish your book. Awesome! And that’s just the stuff I saw inside the dashboard! There are tons of features packed into this tool, making it one of the best eBook creators I’ve seen, but there is one slight negative point which I’ll cover down below. Sqribble is most suited for freelancers, independent internet marketers, small marketing agencies and small business owners who want to create lead magnets, publish Kindle books, create and sell eBooks, or publish white papers. Also included is an in-built “Client feedback tool” to collaborate with clients on eBook projects more easily (I love this feature). Yes, there are currently 4 upsells. You don’t really need all of them to use Sqribble, but they might come in useful depending on your situation and usage. There have been plenty of eBook creator tools in the past, but I haven’t seen any that make the entire process as smooth and quick as Sqribble. It’s surprisingly glitch free (most low-priced tools like this are buggy as hell) and it’s packed with some really cool features. The templates are very nice looking, the layouts are professional and the fact you can automatically add content makes this a must-have for anyone who’s tired of spending hours slaving over book design, writing content and screwing around with formatting. The icing on the cake is the commercial license which is included. Normally vendors charge extra for this, so it’s a huge value added bonus. The additionally provided done-for-you agency website is just over delivery. Sqribble has been developed by Adeel Chowdhry, who is a well-known internet entrepreneur and best seller, with over ten years of experience and has previously created worldwide hits such as Pixel Studio FX which sold tens of thousands of units all around the world. He’s known for creating high-quality professional solutions and I expect no less from Sqribble. If you’re planning to create eBooks, reports or Kindle books in the near future, you owe it to yourself — and your sanity — to pick this up as it’s a tool that you’ll definitely need in your business. The influence that social media websites have on all aspects of human life cannot be stressed enough. Websites like Facebook, Twitter, Instagram and LinkedIn are used by billions of people across the globe. As such, they have the power to shape people’s opinions and attitudes on virtually any topic. The effects of social media on human behavior can take multiple forms and their consequences are not to be underestimated. In this day and age the amount of people using social media website is higher than ever before. Facebook is among the top most popular social media websites in the world and leads the way with 1.59 billion users. Facebook also has the highest market cap of the top three leading social media platforms with $312.78 billion. The photo and video sharing platform Instagram has 400 million users and Twitter is used by 320 million people. The professional social network LinkedIn and bookmarking site Pinterest have around 100 million users each. When it comes to social media and age groups, teenagers and young adults are the heaviest users of social media. The data collected reported that 92% of adolescents go online every day and 60% of them have shared pictures of themselves on at least one popular social media networks. The majority of teenagers are active on more than one social media website with 71% of teenagers maintaining their presence on several social media networks. To find out more about the widespread social media phenomenon take a look at the infographic below to find out 115 surprising social media facts and statistics. Check out Tillison Consulting for your digital marketing needs. Google claim that the phone is 100% made by themselves. The phone looks just like an iPhone which tells us they’re looking to challenge apple in their dominance. The phone has an all-metal body with a glass display. It also comes with the fingerprint scanner feature as well as a headphones socket. The only downside feature is that its not confirmed waterproof. The weight is at 143g, weighing just a tad more than the new iPhone 7. It also feels really good in your hand with its curved edges allowing you to have more grip. The screen size is 5inch with a full HD screen giving it a crisp look, also making it a tad smaller than other phones. The display is very easy to see in direct sunlight making it one of the best screens fitted to a smartphone. * Dimensions: 143.8 x 69.5 x 7.3-8.6 mm * Weight: 143g The pixels retailing price is £599 with 32GB of storage and £699 with 128GB. You can get it in black or silver, if you live in the US blue is also available. There’s literally hundreds of thousands of people into online business these days. There’s affiliate programs for thousands of different companies, many of whom offer commissions for advertising their products and helping to get them sold. But with all this opportunity to make money with commission-based affiliate programs, where should you start? The Internet lives, breathes, and sleeps online business, and there’s MANY different ways to go about advertising to increase sales. In this article, we’re going to be focusing specifically on how to do a sales webinar. With this step-by-step process, you can increase your sales and profits with easy to follow strategies and “tricks of the trade” that really work. Once you know how to do a sales webinar the right way, you’ll know how to do it for any affiliate program or business you want to promote. What Skills Are Required To Host A Sales Webinar? One of the arts of persuasion is Repetition. Most people have subconscious “filters” in their minds that disregard monotonous speech or written text. But once you repeat a specific key point, subject, or fact, 3+ times, people remember it! Why? Because the human mind is “naturally programmed” to be attentive to repeat statements because of survival instinct. Talk show hosts do this all the time. They repeat messages or phrases designed to drive home an important point, and people remember it as the highlight of the program. But you should also be cautious with repetition and use it sparingly, as multiple repetitions are hard to keep track of, get “lost in the shuffle”, and lose their potency with an audience quickly. 2. Motivational Skills – Being able to “motivate” someone into taking action is a precious skill to have. Motivational speakers are famous for igniting passion and hope in their audience, every time they hold a speech. 3. Welcoming Social Skills / Demeanor – A proper sales webinar should be done with a welcoming demeanor and overall feeling presented to the audience. Social skills are necessary when hosting webinars, because when you know people in society enjoy who you are, you stand a much better chance in getting your message across. And when you’re a natural “social butterfly”, the audience will be much less likely to become fidgety or uncomfortable. 4. Language Patterns – Reframing, Presuppositions, Single Bind, Double Bind, and Embedded Commands are all examples of language patterns. The better you get at using language patterns used in society, the better you’ll do. 5. Involve The Audience Through Participation – A webinar can be made into something more beneficial to the audience when it’s Live, and allows the members to participate through asking questions, being quizzed, competing with other audience members, and more. You get much more accomplished and webinar participants are generally more satisfied when attending Live web events. A Sample Step-By-Step Sales Webinar – “Mix And Match” These Steps To Create Your Own! 1. Create A Compelling Title For Your Webinar Event – If you’re hosting a webinar exposing hidden theft rings within the software industry, you wouldn’t simply label it as “Theft In The Software Industry”. It sounds boring and uninformative. Instead, using a title like “Software Theft Rings Exposed! Organized Crime Inside The Software Industry!” is much more robust and explanatory. Make Sure Your Webinar is Branded! Impress prospects and customers while promoting your brand with advanced webinar rebranding features. You can add your logo and brand colors to your webinar room, waiting room and email notifications for total brand experience. This creates a greater impact on your audience. 2. Introduction – Be tactfully brief when explaining what the webinar is all about. Introduce the solution your offering to a problem, and be passionate about the delivering your message. Make it a point to only summarize the product or service you’re offering within the introduction. 3. The “Heart/Guts” Of The Webinar – This is where you go in-depth to explain exactly how and why people should subscribe to your service, buy your product, etc. Statistics help a lot, as do concrete examples of real life situations where your product or service would help. Being able to relate to your audience and exhibit passion about your product or service and how it’s helped you, works well too. (Remember how we mentioned social skills and demeanor help a lot to deliver your message effectively). 4. Conclusion / Final Persuasion Attempt – “Drive home” the main points of your webinar is to with a passionately persuasive outcry to convince the audience your product or service can solve their problem. And don’t come across like you feel indebted or guilty to the audience. You shouldn’t act sheepish to them just for the possibility of them buying your product. Instead, pleading with them to listen to their inner “voice of reason”, is one strategy. Another is to exhibit genuine “surprised shock” at how well your product or service performed in your own life, and that you yourself were surprised at the results. At the very end, you should be convinced you’ve done a great job, and feel confident about how well you did. If you feel like you “messed up”, then edit those parts of the webinar and republish it. 5. Send A Follow Up Email – It’s a proven fact that webinars sending a “Follow Up Email” have higher sales conversions. When it comes to introductions to a product or idea that’s new, people are always hesitant. Why? Because something new is risky and untested to them. Even if they are genuinely interested, a webinar attendee may let your opportunity slip by them because of uncertainty. Uncertainty itself could prevent them from looking you up again, so making it easier with a posted follow up email ensures they have your contact details on file. Amy Porterfield is one of the most well known modern day Internet marketing heros there is. She’s worked with Harley-Davidson, Tony Robbins, and more. And with her 14 years of marketing experience, she now teaches entrepreneurs and small businesses how to make the most of their marketing potential. Amy Porterfield : My favorite success quote is “never let your memories be greater than your dreams.” I love this quote because it’s so easy to get caught in the memories or things that have happened in the past, and I think some of the times, it holds us back from really dreaming big and going for those big goals. Amy Porterfield : “Okay. I’m going to change lives today, I’m going to impact lives. I’m going to be productive. This is what I’m going to work on.” Just getting really clear how you’re starting your day means so much to the flow of your day and your productivity. Lewis Howes is a well known keynote presentation speaker, the author of the book School Of Greatness, an entrepreneur, and business smarts coach. He’s also an Arena League ex-football player.